Six Reasons I Am PSYCHED To Come Back To Liquid Laughs! 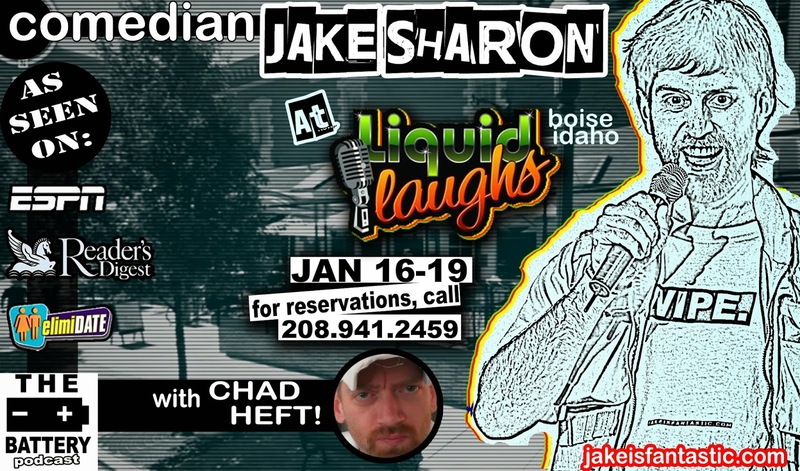 I am so excited because I am coming back to one of my favorite clubs in the country, Liquid Laughs in Boise, ID. Woohoo! Today, I am sharing Six Reasons I am Psyched to come back to Liquid Laughs! "I just want to say: every time I come to Boise I meet more cool comedians. You have such a talented pool of comedians. You guys are so hospitable, and so fun. Your city is the best part of Idaho. If my wife would move to Idaho, I totally would too. But I can't wait to come see you guys over the next couple weeks. Special thanks toJen Adams, Nancy Jensen, Sherry Japhet, Olek Szewczyk, AAron Sheehan, Matt Bragg, Devin Sheffield, Dylan Hughes, Leif Skyving. I know I am leaving a couple people out, but I always love seeing all you guys!" I just wanted to repost this because Boise is a special place for me. I enjoy the climate in the valley. The Snake River is so beautiful. It should be the 8th wonder of the world. Like Asheville, Austin, Boulder, Portland, and some of my other favorite mellow cities, Boise is really into that farm-to-plate, DIY, buy-local, eat healthy, and ride-your-bike-when-you-can mentality. Boise has a real sense of down-to-earth practicality. The people there are arsty and creative- while remaining interested in your arts too. Most of all, every time I meet people in Boise, I make new friends. I know that sounds cheesy, but it's true. They are just good, loyal, good people. Folks in Boise, come see me January 16th-19th. I hope we get to hang out. To get into the show, make a reservation on Liquid's website or call 208.941.2459. Then you can be my friend too- for FREE -well, you have to pay to get into the show- but my friendship is FREE!